(2016). Preconcentration of Hg(II) with novel nano-Fe3O4- sorbents prior to determination by CVAAS. International Journal of Bio-Inorganic Hybrid Nanomaterials, 5(3), 203-212.
. "Preconcentration of Hg(II) with novel nano-Fe3O4- sorbents prior to determination by CVAAS". International Journal of Bio-Inorganic Hybrid Nanomaterials, 5, 3, 2016, 203-212. (2016). 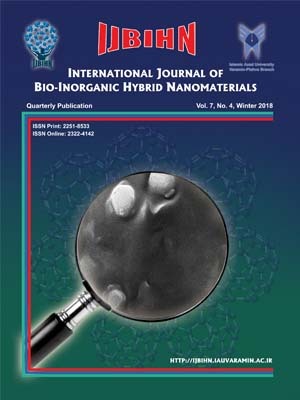 'Preconcentration of Hg(II) with novel nano-Fe3O4- sorbents prior to determination by CVAAS', International Journal of Bio-Inorganic Hybrid Nanomaterials, 5(3), pp. 203-212. Preconcentration of Hg(II) with novel nano-Fe3O4- sorbents prior to determination by CVAAS. International Journal of Bio-Inorganic Hybrid Nanomaterials, 2016; 5(3): 203-212. A novel, simple, sensitive and effective method has been developed for preconcentration of Hg(II) on nano-Fe3O4-DOP-ED solid-phase extraction adsorbent. In this paper, Dioctyl phthalate (DOP) was used to encapsulate nano-Fe3O4 and produce a nano-Fe3O4-DOP sorbent based new sorbent was prepared. This was treated with ethylenediamine (ED) in another solvent-free procedure for the formation of a novel nano-Fe3O4-DOP-ED. Flame atomic absorption spectrometer was utilized for determination of Hg(II). Some of the important parameters on the preconcentration and complex formation were selected and optimized. Under the optimized conditions the limit of detection (LOD) and limit of quantification (LOQ) were 49.6, 163.7 ng L-1 and the proposed method has a good reproducibility 0.90% (RSD %) and preconcentration factor was found to be 200. The methodology was applied for determination of Hg(II) in natural water samples and satisfactory results were obtained.